To describe the woods, fields and yards of our neighborhood during the past week is to speak more of what’s not there than of what is. The Fall season has crept in quietly here – though quiet in a relative sense. Carolina Wrens still sing and chatter and fuss and burble, and it’s at this time of year that I always notice most their amazing vocal variety. Carolina Chickadees and Tufted Titmice still move through the trees in small gossiping bands. The “pik-a-tuk” of a Summer Tanager, the throaty song of a Yellow-throated Vireo, and the “whreeep!” of a Great-crested Flycatcher can still be heard from time to time, though not nearly as often as a few weeks ago, and there’s at least one Eastern Wood Peewee lingering in the trees down the street from us, singing broken pieces of its summery song from time to time. The most noticeable singers this past week have been Phoebes, which begin their wheezy, brisk songs at first light and continue most of the day. This morning I heard three singing at the same time, just along one stretch of road, and came to another and another and another as I walked through the neighborhood. Wind rustles through the trees. Dry leaves and pine needles shower down in a soft clatter. Acorns plop or thunk. The shrill, thin noise of insect legs and wings and hearts is constant in the background, a few remaining Chimney Swifts twitter in small groups overhead, Bluebirds murmur from perches in the tops of trees, and noisy gangs of Blue Jays and Crows roam from yard to yard. Nevertheless, it feels quiet, and is, compared to the musical fullness of Summer. In the Old Field, now dry and withered from a long time without rain, but flooded with the dusty yellow and dull green of Goldenrod and Ragweed, the bold, colorful songs of Indigo Bunting, Blue Grosbeak and Yellow-breasted Chat are gone. Even the sharp “plink” of the female Blue Grosbeak, which stayed until very recently, seems to be gone now – though in its place, I’ve heard the mew of a Catbird, the percussive song of a White-eyed Vireo, and the harsh calls of Brown Thrashers and Mockingbirds. The demanding scream of the juvenile Red-tailed hawk that used to sit for long hours on a utility pole over the Old Field is rarely heard now, though on the other hand, two Red-shouldered Hawks have been soaring very high in deep marbled blue and white September skies and calling frequently. In the woods, the Acadian Flycatcher’s dry “tse-wheet!”, the Yellow-billed Cuckoo’s exotic “Cawp-cawp-caalwp,” the Mississippi Kite’s high, descending “pe-teeeew,” the repeated refrain of the Red-eyed Vireo, and the “chip-burrr” of a Scarlet Tanager’s call remain only as memories. And I guess that’s what seems most alive in this relatively quiet time – while I watch and wait for unusual warblers and other migrants that might pass through, and for the first arrivals of our Winter residents – there are good, sun-ripened memories of the Summer past. While birds have been quiet and elusive this week in Summit Grove, butterflies seem to be everywhere. Tiger Swallowtail, Black Swallowtail and Red-spotted Purple butterflies float in and out of treetops, shrubs and over grassy yards. I’ve found Fiery Skipper, Silver-spotted Skipper, Southern Hairstreak, Gray Hairstreak, Buckeye, Painted Lady, Gulf Fritillary and Hackberry in our lantana and butterfly bushes. Clouded Sulphur and Sleepy Orange seem to like the Old Field and roadside wildflowers and weeds. And I saw one bright, sleek Viceroy butterfly on the sunny edge of a lawn. But my favorites this week were dozens of Little Wood Satyr butterflies that fluttered every morning on the edge of the woods in some tall roadside grass going to seed, in an area where the early morning sunlight was just beginning to reach. A pale sandy-gray color, with pretty but subtle markings, Little Wood Satyrs are very common and might easily escape attention, but with so many of them fluttering among the grasses, they make this particular spot look enchanted, like a still picture that has come to life. At any one time, while most are still flying, several have paused and cling to the stems or seed-heads of the grasses, looking like paper-thin, wing-shaped blooms. A close-up look reveals two large, dark “eyespots” on each wing, and several smaller eyespots, and delicate, rippling patterns of lines across the wings that look like the tracks of water over sand. Morning glories in several shades of pink, purple, blue and white bloom in the ditch along the edge of the Old Field, tumbling over a messy tangle of kudzu, honeysuckle, and foxtails. Smaller dark red-orange morning glory vines wind in and around privet, pokeweed, ragweed, and goldenrod. Persimmon trees are loaded with fruit. Several Mockingbirds sit on the wires over the Old Field, mostly silent, but at least two White-eyed Vireos have been singing now and then from the densest thickets. A family of six House Finches has been fun to watch, hunting just about every morning along the roadside, sometimes sitting on the wires, and chirping to each other constantly. Our resident male Blue Grosbeak, which sang all summer, is among the few birds still singing every morning – or was until about the middle of this week. He seems only to sing fairly early, from one or two favorite perches, and his plumage, seen in the right light, is still a deep, rich blue, with copper wing bars. A female Blue Grosbeak is often around, too, sitting on the branch of a bush and calling “tink!” Her color is an appealing rosy-tan, and I particularly enjoy watching her because her posture and movements show a fascinating range of personality and moods, all distinctively feminine – or at least they look that way to me. The most colorful bird sighting this week was a Red-headed Woodpecker that flew over one morning as I was walking. The flash of its white breast caught my eye, and when I looked with binoculars, its blood-red head, white breast and ink-black back and wings stood out sharply against a deep blue sky. There’s also been a Yellow-throated Vireo singing in the Big Oak at the corner of our cul de sac; an Eastern Wood Peewee singing now and then; two Black and White Warblers that visited the White Oaks by our back deck, quietly but busily creeping over branch by branch; two Red-shouldered Hawks soaring and calling most mornings; a juvenile Red-tailed Hawk that sits atop a utility pole along the edge of the Old Field, though not as often or for as long at a time as it did earlier in the summer; and a Cooper’s Hawk that I’ve seen twice as it flew overhead, low enough for me to see the fine reddish bars on its breast and the white band on the end of its tail. A long stretch of very dry, warm, sunny weather has helped to turn the leaves of many trees in the neighborhood a crusty brown or yellow already, giving the landscape a somewhat prematurely faded and withered look. The leaves of river birches already lie around them in pools, and the small brown leaves of water oaks shower down in the late Summer wind, clattering across sidewalks, and beginning to pile up. On a hot, humid, hazy afternoon in early July, I stepped out of my car at the edge of a farm pasture in Madison County, Georgia, trying to avoid stepping in one of the many fire ant nests that peppered the scrubby grass, and looked out toward a big sweet gum tree that stood in the middle of the field. Almost immediately, a bird appeared like a dreamy mirage, as if my own expectations had created it, and flew out of the sweet gum and into a smaller tree several feet away – a medium-sized bird trailing an amazingly long, thin, elegant tail – the unmistakable shape of a Scissor-tailed Flycatcher. The sight was made possible for me by Mark Freeman, a fellow birder who discovered a pair of Scissor-tailed Flycatchers nesting here and let others know about it through a posting on Georgia Birders Online. With the permission of the landowners, he included directions to the site. My husband, Clate, and I arrived about the same time as two other couples, and we all watched the birds from the side of the road for half an hour or more – though most of that time, only one was in view. For one or two minutes, through my scope, I saw both male and female sitting together on a branch of the smaller tree out in the field. Then both flew away. In flight, their bodies looked almost like arrows, with the long tail held out straight, its thin shape swelling at the end. A few minutes later, we discovered one of the birds – we think it was the male – perched in the top of a pecan tree near the roadside, giving us a very good view for several minutes. Even through binoculars, he was handsome, and through a scope, his features stood out well against the hazy blue sky. 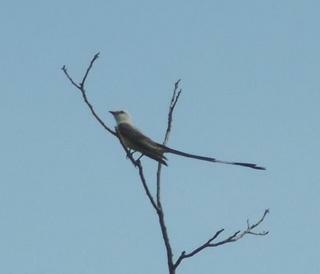 The head, breast, and back of an adult Scissor-tail Flycatcher are very pale gray, but to me, they appeared white, and the head and neck looked large and strong. Long, shadowy, dark gray wings extended down below the tail as he perched, and the black and white tail itself swept out majestically in a thin, stiff, shallow curve up, like the feathery strokes of a paintbrush extended preposterously far. As he perched, he looked around alertly, head held high, and he looked solid and sturdy, despite the extravagant tail. He called repeatedly, a rather liquid, loud and emphatic “preep!” Once, he lifted his wings briefly, as if to shake them, flashing the bright salmon pink color underneath them. Scissor-tailed Flycatchers usually nest in a relatively small area that includes much of Texas, Oklahoma and parts of adjacent states, in open, brushy country, maybe not unlike the pasture where we saw them here. To find them nesting in Georgia, or even to see them here, is rare. The landowner came by while we were there, and offered to let us walk closer so that we could see the nest, so we all six walked through the gate and across a minefield of cow patties and fire ant nests — a small price to pay — and got close enough so that we could see it, barely. It was tucked into the thick leaves of the sweet gum tree, fairly high up, and we could not see it well, or tell if there was a female sitting there. But the male returned again and again to the high branches of the pecan, and we stopped on our way out to take a last look. Seeing these Scissor-tailed Flycatchers here, so close to home, reminded me of how much we most often miss of what goes on in our own natural landscape, all around us. Thanks to an observant and generous landowner, who first spotted these unusual birds and was kind enough to share them! On a warm morning in the first week of May, I watched a pair of Blue Grosbeaks flying around and around an old field in a flashy and fascinating way. It was early morning as I came to the field on my walk. The noise of traffic from a nearby highway was loud, but the scent of honeysuckle drifted out from the thickets, and a miniature prairie of colorful wildflowers and grasses bloomed along the roadside. The white blossoms of blackberry vines spread across the shrubs and grasses like dusty snow, and birdsong could be heard even over the constant grumble of big trucks. An Indigo Bunting, at least two White-eyed Vireos, a Yellow-breasted Chat, a Field Sparrow, and a Gray Catbird all sang, along with the calls of Eastern Towhees, Cardinals, Brown Thrashers and Blue Jays. Mockingbirds sat silently on the wires and flew down and up again, flashing white wing patches. A pair of small, dark birds flew low and fast across the road in front of me, one apparently chasing the other, out of some trees and bushes on one side of the road, and into the field on the other side. I watched them, and caught one in my binoculars as it paused in the branch of a chinaberry tree in pale purple bloom. It was a brilliant deep-blue Blue Grosbeak male. But he didn’t sit still long. In less than two seconds, he flew again, chasing the other bird, and when it stopped briefly on the edge of a bush, I saw that it was a female Blue Grosbeak, much more subdued in color, a rosy brown. No sooner had she stopped than the male came up beside her – and she immediately flew off again, with him right behind her. I stood for almost half an hour on the edge of the field, watching as the pair flew around and around, fast. He seemed to be chasing her, mostly. They swooped around, she paused on the branch of a tree or bush, he flew up and stopped beside her – and she immediately flew again, with him in pursuit. This they did over and over. Sometimes I could see them when they paused, sometimes not, but they never stopped for long. They swooped low, just over the tops of the grasses, and higher, weaving in and out of shrubs and small trees, sweeping over a large extent of the field. His copper wing bars and huge, silvery bill were prominent, and his color was intensely blue. She looked more like a shadow, cinnamon colored, but when she paused on a branch, she looked alert, head held high, feathers on her crown standing up. Since Blue Grosbeak males may arrive in their nesting territory before the females, maybe they were celebrating her arrival, or maybe their flights were part of their courtship behavior. But I’m only guessing. Little seems to be known about many aspects of the lives and behavior of Blue Grosbeaks. Though I really don’t know what they were doing or why, the clear feeling I got from watching them was one of sheer exuberance. The last day of April began dark, under threatening clouds, and by mid morning thunder, lightning and heavy rain had begun, and continued until after noon, followed by almost an hour of strong, gusty winds that ebbed and flowed like nausea, tossing the trees wildly, then subsiding, only to return again and again. Then abruptly, the wind stopped and the sky began to lighten. I walked out onto the deck behind our house, surrounded by clouds of wet green leaves, and found the trees sparkling with birdsong and bird activity. A Red-eyed Vireo, Pine Warbler, Black and White Warbler, Yellow-rumped Warbler, and Parula Warbler all were singing, and the song of the RE Vireo seemed especially sweet and crisp, as it went from branch to branch, low in a White Oak tree near the deck, singing intensely and fast. Also in the trees nearby were a quiet Yellow-throated Vireo, a male Blackpoll Warbler, and a Cape May Warbler in full spring plumage. I had heard the Cape May singing earlier in the morning, before the rain began, but had been unable to spot it in the dim gray light. Now, as it moved from spot to spot in some low branches not far away, its bright yellow neck and breast, streaked with black, and its coral cheek, dark head, yellow rump, and prominent white wing coverts all stood out warmly among the green leaves. From our front porch, on the north side of the house, I could see the clouds clearing from the West. A House Wren sang loudly and cheerily, along with a Bluebird, Robin, Chipping Sparrow and Carolina Wren, and a Red-bellied Woodpecker flew into the top of one of the trees and whirred. I was watching a female Blackpoll Warbler that had just flown into a pecan tree, when I saw on a branch just above it a flash of red—a male Scarlet Tanager, and slightly above him, a female. For several moments, they fed in the tree, the male, “flaming scarlet,” as Peterson’s Field Guide says, with jet-black wings, went from branch to branch and flew up now and then to catch and swallow flying insects. The female, a soft, dark lemon color with wings just slightly darker, stayed closer to the branches, feeding on something in the leaves or flowers of the pecan. They could not have appeared more striking, as if posed for a photo, in green leaves glistening wet, with the clearing sky of gray and cream clouds behind them. Summit Grove, Oconee County, Georgia. A beautiful, slightly cool April morning. Soft blue and white sky, warm sunlight filtering through the new green leaves on our oaks and pecans. A Blue-headed Vireo feeds quietly in the branches of one pecan tree, and I watch as it travels from place to place, cocking its head this way and that and looking upward in its characteristic way, as if uncommonly curious about what’s going on around it. Its bold white spectacles add to that impression, giving it a wide-eyed, intensely interested look. It is silent, not singing or calling, just feeding. I watch it eat one long, wriggly shaped thing that’s probably a caterpillar. The Vireo’s blue-gray head, grayish-green back, pure white throat and breast and wash of yellow on the flanks look elegant in the early sunlight, and I can even see the slightly heavy bill and the way it turns down sharply at the end. The woods and lawns of our neighborhood are full of birdsong, bird calls and bird activity, all beginning in earnest around 6:30 each morning recently. A Black and White Warbler goes from treetop to treetop all around our house singing its high, squeaky-wheel song. A newly-arrived House Wren sings brightly, loudly and constantly, a cheery, burbly song, and I’m hoping it might stay around (I think there are a pair) and nest here. We’ve never had them before. They arrived just yesterday morning, singing loudly to announce their presence, and they’ve been vocal and active ever since. Cardinals, Eastern Towhees, Carolina Wrens, Tufted Titmice, Carolina Chickadees, Goldfinches, Chipping Sparrows, and a Pine Warbler, Red-eyed Vireo and Yellow-throated Vireo all are singing, and a Great-Crested Flycatcher calls “Whreep! Whreeep!” repeatedly from the woods. A Red-bellied Woodpecker calls its purring “whirrrrr” and flies from trunk to trunk around the edge of the woods. The loose, softly jangling songs of both Palm Warblers and Yellow-rumped Warblers ripple here and there all around the house, among the low branches of the trees. But the highlight of the morning has been the songs of a Summer Tanager, a Scarlet Tanager and a Robin. All three have been singing nearby, and it has been a perfect opportunity to listen to them and compare. The Robin sings from two or three houses down the street from us, in a sweet, clear voice with distinctly thrush-like qualities. A Summer Tanager sings from a perch in the very top of one of our pecan trees, whose new leaves are still not fully opened. He glows a slightly orangish-red in the sunlight, and his song, though “robin-like,” is harsher, less musical, with distinctly “tanager-like” qualities, and clear pauses between the phrases. The Scarlet Tanager sings from the woods, hidden in the trees. He’s been singing for several days now in the same area, but I’ve not yet seen him, and I think he prefers singing from lower, less prominent perches than the Summer. His song, though, is unmistakable. It sounds more like a Robin than the Summer Tanager does, but is hoarse, and less musical than a Robin, and faster and less varied than the Summer. I think I would say that the Scarlet Tanager’s song is less baroque than the Summer, who sounds rather rounded and curled. The Scarlet’s song is more direct and less ornamented. Summit Grove is a small neighborhood in Oconee County, Georgia, about an hour’s drive east of Atlanta. Most of the homes were built a decade or two ago on the site of an old pecan grove, and many pecan trees still shade the two quiet streets and large grassy yards. Located between two creeks that converge not far from our house, the neighborhood is buffered on roughly three sides by a wide band of woods extending down steep hillsides to the creeks. A few lots remain unoccupied by houses and have grown up in tall grasses, shrubs and small trees, and there’s one small pond. There’s also a large old field that runs the length of the dead-end road that leads to our subdivision and the one next to it, called Summit Oaks. Beyond that field lies a busy highway, U.S. 441. The neighborhood’s mix of woods, fields, creeks, shrubs and lawns attracts many bird species, as well as white-tailed deer, bobcats, foxes, coyotes, bats, turtles, frogs, snakes, butterflies and other forms of wildlife. We’ve identified at least 102 species of birds, including both residents and those just passing through. The woods that provide the most important part of the landscape are made up mostly of hardwoods – white oak, red oak, water oak, tulip poplar, sweet gum, beech, and American hornbeam, with dogwoods in the understory and pines in some areas. Because I’m especially interested in them, most of my natural observations focus on birds, but I’m also trying to become a better observer, and to learn more about the other members of the natural community here. Although I frequently visit other places to watch birds and other wildlife, I have always felt most interested in what I observe around our own home. I write about my observations here, in part, because I believe it’s important to live with the natural world – not only to visit it on weekends or vacations. It’s important that we learn to recognize and value the plants, animals and natural communities around our own homes, so that we understand that conservation of the natural world is not something that only needs to be done somewhere else, in some pristine or exotic place. The natural world – even the grandest and most spectacular places – will be protected in the long run only if more of us come to know it and respect it here at home.